Pond pebbles are a commonly seen accessory in both ponds and water gardens. They provide a number of important benefits, such as maintaining cleaner water and providing a bottom that is more natural looking and safer for the fish. Pebbles work better for smaller ponds, because larger ones tend to have a considerable amount of mud which swallows them up. Here are some tips for using pebbles the right way. 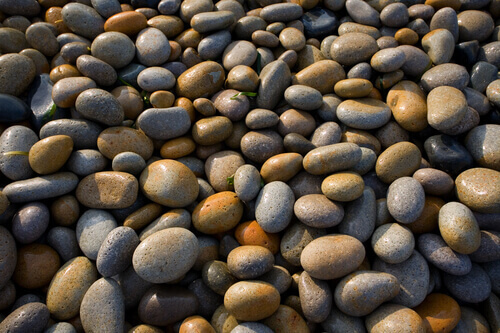 Pebbles come in a variety of sizes and shapes, so it is important to keep this in mind when shopping for them. The most ideal pebbles are those which are approximately one inch in diameter. Pebbles of this size are big enough to capture sediment but aren’t so small that they compact together too tightly. The best shape for pebbles are those which are round, and if you’re using pebbles which you’ve collected from nearby lakes, streams or oceans you should clean them carefully to get rid of debris. Some pond owners are under the misconception that placing pebbles at the bottom will make it more difficult to clean, but this isn’t true. Pebbles actually maintain healthier water by trapping sediment and preventing it from rising back to the surface. Pebbles also offer a surface which welcomes the growth of bacteria, which assists in the dissolving of dirt within the pond, leading to fresher water. Pebbles provide an ideal habitat for many types of pond animals, primarily by offering them a place to rest or hide. Pebbles which are placed on the pond’s bottom will play a role in holding down plants which allow fish to hide and protect themselves from predators and excessive sunlight, as well as a place to sleep. Many pond owners will place large rocks around the outside of the pond where fish can hide and swim under, but even these larger rocks will need to be held down by pebbles. Another important function of pebbles is to hold down the liner. The liner is responsible for maintaining the cleanliness and clarity of the water, especially when the pond was dug directly within the soil. Without pebbles to hold it down, the liner would be susceptible to floating. Therefore pebbles play a crucial role in allowing the liner to do the job that it was designed for. The most ideal pebbles are those which are functional but which can also be used for the decoration of a pond or water garden. They are best purchased from a store, as you can get lots of high quality, polished and clean pebbles within a single bed which are taken directly from the heads of rivers. You can collect them yourself if you want, but this will require an extensive amount of time and labor as the pebbles will need to be collected and cleaned, which can be time consuming. Store bought pebbles also come in a variety of different colors and designs that will harder to find in the wild.